Consuming milk on a regular basis is considered excellent for overall health because it contains a variety of nutrients. In addition, you can also apply it on your skin to make it soft and radiant. In fact, it works as a wonderful cleanser. Moreover, it helps soothe skin irritation and sunburn. Milk is rich in protein, fat, lactose, calcium, zinc, vitamin A, vitamin B complex, vitamin D, and so on. When including milk in your skin-care recipes though, prefer to use raw milk. If you have oily skin, use skimmed milk, otherwise use whole milk. • Prepare a skin lightening face pack by applying a smooth paste prepared by adding milk in fuller’s earth. This recipe is highly beneficial for those who have normal to oily skin. • Mix one tablespoon each of fresh lemon juice, organic honey, and milk powder to form a paste. Leave it on your face for about 10 minutes and then rinse it off to heal acne scars and get smooth, glowing skin. Alternatively, you may use a combination of lemon juice, almond oil, and milk powder. • Make a simple anti-aging facial mask by combining three teaspoons of milk and four teaspoons of honey. Gently massage it on your skin and wash it off with lukewarm water after 15-20 minutes. Follow this simple treatment at least once in a week. • Soak 8-10 almonds in milk overnight. Next day, peel the skin of the almonds and grind them along with the milk in which they were soaked. Both these ingredient help improve skin tone and texture. Furthermore, it exfoliates the skin and removes dead skin cells. • Get clear skin by applying a combination of two tablespoons of milk, one tablespoon of turmeric powder, and half tablespoon of lemon juice. Leave this mixture on your face and neck for 15-20 minutes. When dealing with suntan, use two teaspoons of raw milk mixed with the same amount of cucumber juice and a few drops of lemon juice. • Take a cup of warm milk and mix a tablespoon of honey and two drops of lavender essential oil in it. Dip a cotton ball in this solution and apply it on your face and neck to maintain soft and beautiful skin. In case you do not have milk, use two tablespoons of powdered milk. • Add one teaspoon each of orange juice and honey in a cup of milk. Use this homemade recipe to bleach your skin naturally. • Mash a medium-sized banana, and mix a cup of ground oatmeal and a quarter cup of raw milk in it. Scrub your skin with this paste and rinse it off after 15 minutes. Check out this video showing how to do a simple DIY milk cotton mask. • Soaking in a bath tub filled with one or two cups of milk mixed with half a cup of sea salt to heal dry skin and ease skin irritation caused by problems like eczema, psoriasis, etc. • Another milk bath can be prepared by mixing two tablespoons of cornstarch, one tablespoon of cream of tartar, few drops of scented oil (essential oil mixed with carrier oil), a cup of baking soda, and a cup of powdered milk in warm bath water. 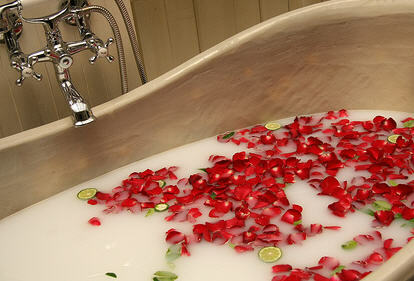 • Try a Cleopatra milk bath for relaxation. Start by steeping one tablespoon each of dried rosemary, thyme, and mint in two cups of boiling water. Leave it overnight and then strain the liquid in the morning. Next, empty a small box of milk powder (up to 10 ounces) in this infusion and add the peels of a lemon and orange in it. Pour this mixture in warm bath water and soak in it for about 20 minutes. • Mix equal amounts of milk powder and oatmeal. Add half a cup of this powder in your bath water to soothe dry skin, particularly during winters.